Need help identifying a controller board. 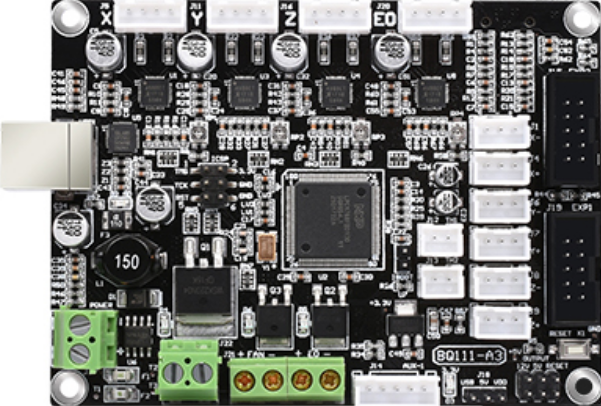 I'm trying to locate OSX drivers for this board that comes in the BIQU Magician delta printer. The PCB has "BQ111-A3" on it and the touch screen's PCB has "BQ112-A3" stenciled. The board came pre-mounted so I can't get to the underside without disassembling everything. The controller is marketed as a "BIGTREETECH 32 Bits MainBoard". Based on the GUI, as far as I can tell since there isn't a menu About option, it's running Smoothieware (I'm coming from a Marlin world so this is my best guess). Anyone seen this board before and know what drivers I should be using to talk to it? Re: Need help identifying a controller board. "If using Linux or Mac, just plug the USB cable into the computer and the Smoothieboard, and everything should work right out of the box." The board shows up fine under Linux. I'm using OSX 10.12 - I'll dig deeper to see if there are any system error messages when I plug in the board. Under Linux, Pronterface works fine. In the kernel log, the board showed up as "CP2102 USB to UART Bridge Controller" so I figure it could be missing the VCP driver on the Mac. I installed the driver from Silicon Labs and the board is now showing up, and Pronterface is working fine. Unfortunately, I still can't identify the board, but at least I can talk to it. *edit* Finally got word from the manufacturer. Biqu says "Because it is our latest research and development, so the market has no spare parts"
Edited 1 time(s). Last edit at 09/26/2017 09:11AM by firefly555.